Timid, cuddly and skittish little guys, guinea pigs can make ideal small pets for those who don't want the hands-on companionship and care requirements of a larger animal. Guinea pigs' behavior mimic other rodents', their teeth being no exception. They must gnaw to keep their teeth a healthy length. Give your pig twigs from apple, willow or birch trees that haven't been treated with chemicals. Such sticks will help keep a guinea pig's teeth in order and provide a chew toy for a week or more. Feed your little guy fresh, crunchy veggies in addition to his regular pellet diet. Guinea pigs need vitamin C added to their diet, and this is a way to do that. Crunchy carrots, broccoli stems and similar veggies will be a healthy treat and a natural teeth filer. Give a small handful of veggies everyday, about enough to cover just the palm area of your hand. Feed firm hay such as timothy hay or alfalfa hay. While these aren't as crunchy as the aforementioned items, they have a bit of crunch to them and work well on the teeth. Hay should also be a main part of your pig's diet, and most pellets contain hay. Place a hay cube in his cage every other day or place a handful or so of hay in a bowl or hammock every other day. 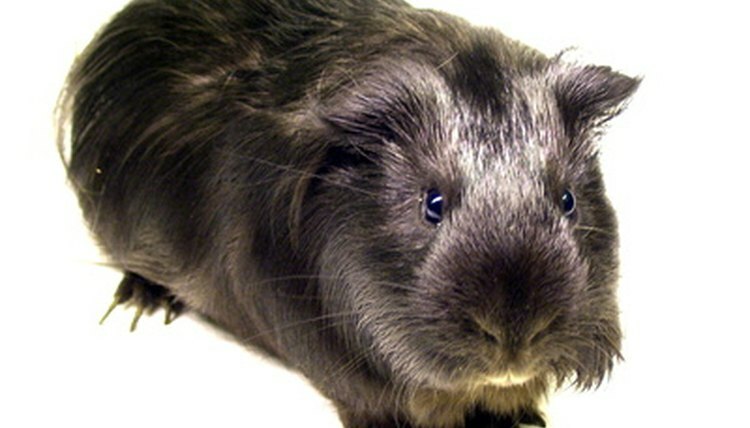 Take your guinea pig to the vet to have his teeth filed or otherwise cut to size in the event his teeth overgrow. When allowed to grow continuously, his teeth will begin to curl back and toward the roof of his mouth. This prevents a pig from eating or drinking, and can cause serious pain and reshape his mouth.  Quality pet-supply stores sell various chew toys for guinea pigs. Some are interactive such as balls with treats or small wreaths. A couple of these will help his teeth and keep him entertained.  Your pig will chew instinctively to control his teeth. Don't put any plastics in his cage or he will chew it, which can cause choking or other problems.